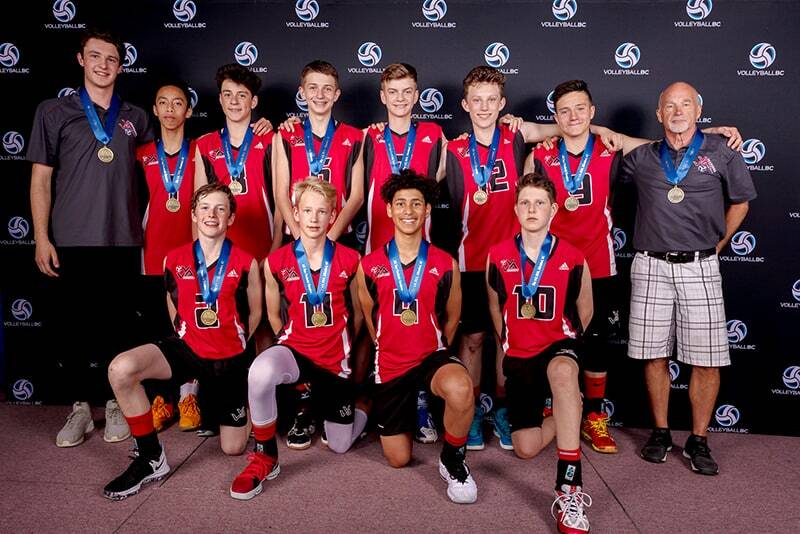 In front of a packed crowd on Saturday evening, the Victoria Chargers knocked off Seaside Surf in straight sets, 25-13, 25-10 to capture the 14U Boys Provincial Championship. The run to gold was in doubt earlier in the day when Victoria trailed Volleytech, 9-2 in the third set of their quarterfinal match. They eventually rallied to win that set 15-12 and later knocked off Focus to advance to the Gold Medal Game. “In the quarterfinal, we won big in the first set, lost the second and we were down 9-2 in the third and we fought through,” said Victoria’s coach, Rick Wutzke. It was the adversity Victoria battled through earlier in the tournament that help them stay relaxed and focused in the final, as they made sure they didn’t take their foot off the gas this time. Wutzke was also highly complementary to one of his youngest players, Tomas Godoy, singling him out as a natural leader who kept the team’s spirits up all weekend long. Godoy, who was the team’s recipient of the Most Inspirational Player Award before the tournament, was ecstatic with the win. His teammate, Piers de Greeff, echoed Godoy’s thoughts about this win being all about the team, saying his teammates were the first thing that came to mind when the Gold Medal point was scored. “We just wanted to go out and much as few mistakes as possible and everyone played well today,” de Greeff said. Thank you to our friends at belairdirect and GLC Solutions for your support! By supporting our partners, you’re supporting volleyball in B.C.